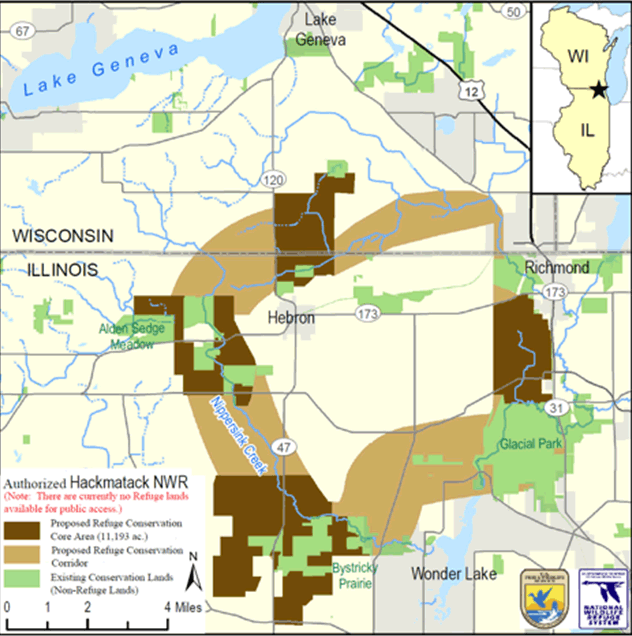 The Hackmatack National Wildlife Refuge is a newly established United States national wildlife refuge that will include noncontiguous properties, especially tallgrass prairie patches, wetland properties, and oak savanna parcels, located in the northwestern region of the Chicago metropolitan area and the southern part of the Milwaukee area. The refuge's boundaries encompass parts of McHenry County, Illinois, and Walworth County, Wisconsin. The refuge will be operated by the United States Fish and Wildlife Service, known as USFWS. 85 percent of the refuge will be in Illinois, and 15 percent in Wisconsin. The refuge will cover 11,200 acres of land in Illinois and Wisconsin, which will complement 23,000 acres already acquired for public use or under environmental protection as of 2011. Existing parklands adjacent to the proposed refuge's boundaries include several McHenry County Conservation District areas. The name Hackmatack is an Algonquin term for the American tamarack or Larix laricina, an evergreen formerly abundant in regional wetlands. Hackmatack was the word used by many language groups in the Algonquin language group, including the Potawatomi, the tribe that most intensively utilized this ecosystem at the time this area was first mapped in the 17th and 18th centuries. 109 separate threatened or endangered species, including 49 species of birds, are listed within the area being studied for the proposed refuge designation. Examples of endangered fauna that find a home within the boundaries of the proposed refuge include the Blanding's turtle.